A lot of gearheads don’t watch this series, but that’s a shame because they should. MotoGP racing involves total commitment. Put one wheel wrong and the bike is out from under you, and your race is done. That’s happened to race leaders in both races so far this season, with both rookie Johann Zarco (Tech 3 Yamaha) and three-time champion Marc Marquez (Repsol Honda) sliding out of their races. It all gets underway with the pandemonium of the entire grid trying to squeeze into the same real estate in the first corner, and races are filed with passing and blocking efforts that can get increasingly desperate as tires wear out and the checkered flag nears. Unlike Formula One, there’s no disadvantage to following closely behind. In fact, it’s the opposite: There is a pronounced slipstream effect that can be used to catapult the trailing rider ahead on straightaways. The lesson here is that anything can happen in a race, so you’re best advised not run off to grab another beer while the riders are duking it out on the track. The good news is that these races are a sprint, not a marathon, with Sunday’s 21-lap race lasting all of about 45 minutes from start to finish. So who should you be watching? MotoGP fans rejoiced last year over a season that featured a record nine different winners, including the least-probable one by Jack Miller (he of the drinking champagne out of his racing boot fame, since emulated by fellow Australians like F1 driver Daniel Ricciardo). Anyone can win, especially in wet weather. Marquez won the championship on the Honda last year by stringing together the most consistent performances instead of risking everything for the win. That arguably made the Spaniard less exciting to watch than in seasons past, but it’s hard to argue with the result. Jorge Lorenzo is hoping Austin will to turn around his first season with Ducati. (Photo credit: Ducati). 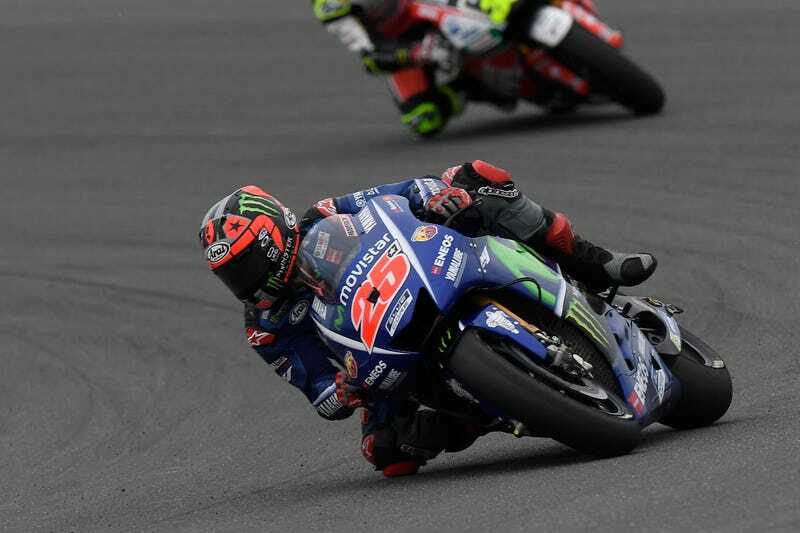 Viñales made the switch from Suzuki to join the Valentino Rossi, the sport’s ageless wonder and undisputed biggest star, at Yamaha. That seat opened when another multiple champion, Jorge Lorenzo, moved to Ducati after clashing with Rossi. So far the move has turned out perfectly for double race winner Viñales, while Lorenzo has struggled mightily. Lorenzo didn’t even make it through the first turn in the last race in Argentina after coming in 11th in Qatar. Lorenzo is hoping a strong showing in Austin will help turn his season around. “We’re working well together and I’m sure this difficult moment will be over soon,” he said. Rossi, who at 38 is ancient by motorcycle racing standards, didn’t impress in off-season testing, but has stormed into this season with two podium finishes and showing little sign of letting up. And with seven championships under his belt, opponents have learned to underestimate Rossi at their own peril. Yeah, yeah, so nobody is rooting for any rider to wipe out on track. But these guys are riding on the edge in practice, qualifying and in the race, so it’s going to happen. Especially early in the race weekend, riders need to push themselves to the limit to know how far they can push their bikes during the race. And the quickest way to find that limit is to go over it when the stakes are low. While motorcycle wrecks look spectacular, the safety standards in terms of rider gear and track layouts have happily lessened the risk of permanent injury or death (with a few recent tragic exceptions). During the race, a crash essentially means the end of the contest – no matter how frantically riders scramble to try to get their machines back upright and on the track. For the non-racing motorcyclist, there’s something reassuring about seeing these guys eat it at high speeds, slide across the tarmac and trough gravel traps, only to pop up and walk away unscathed. We all know in the back of our minds that riding motorcycles can be dangerous, but we all want to believe that a wreck just as survivable on the street. There was a time when Americans so dominated Grand Prix motorcycle racing that they might have well made the Stars and Stripes a permanent fixture on the championship trophy. American riders like Kenny Roberts, Eddie Lawson, Freddie Spencer, Wayne Rainey and Kevin Schwantz accounted for 13 out of 16 championships between 1978 and 1993. But U.S. riders have taken just two more championships since then, the last coming from Nicky Hayden in 2006. With Hayden’s move to World Superbike last year, there’s not a single American remaining in MotoGP or in its feeder series, Moto2 or Moto3. The AMA-sanctioned MotoAmerica is trying to change that by giving young riders an opportunity to build and showcase their talents. The series kicks off its season alongside MotoGP this weekend. Okay, you’ve sold me. What’s the schedule? Great! Like Formula One, it’s a three-day affair, Friday, Saturday and Sunday; practice, qualifying, race. And the various other series like Moto2 and Moto3 run on between. It’s a smorgasbord of bike racing all weekend in Austin. You can find the full schedule here at COTA’s website, but the most notable thing is the MotoGP race itself, which happens Sunday at 2 p.m. CT/3 p.m. ET. Well, that’s the downside. The TV broadcasts are solely controlled by the beIN Sports Network these days. Don’t have beIN on your provider? You’re outta luck, pal. If you do have beIN, here’s the TV schedule. If you’re among those people in America who has beIN Sports, you can watch tape-delayed qualifying on Saturday at 9 p.m. EST and the race on delay on Sunday at 5:15 p.m. EST, followed by the MotoAmerica race. The upside is that you can also pay for a video pass to watch the race. Here’s the website for MotoGP Live. It’s about $20 for the whole weekend (or $135 for the whole season) which isn’t bad at all. Of course, you could find a stream somewhere on a less reputable corner of the internet, but the risks of that—and the poor quality sure to result—are on you. I certainly can’t advise it. Your best bet, if you’re anywhere near Austin, is to come on out. The gates will be open from roughly 8 a.m. to 6 p.m. each day, and kids under age 12 get in free if they are brought by someone with a general admission ticket (rope the kids in early!). We’ll be there all weekend too, so come say howdy, as they do down here.